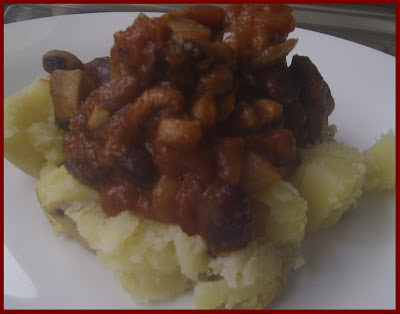 You will remember that I made a 3 bean chilli which hubby said looked like cowboy stew. I took this as a compliment and have renamed the dish. I still had some left over so I baked a potato and piled the cowboy stew on top. It was delicious the flavours had intensified since yesterday and I thoroughly enjoyed my Cowboy Stew! Tonight, I was cooking under pressure, hubby was hungry and needed to be ready for his plans by 7:00pm. I was blogging, so he went and threw some sausages and chips in the oven. We always eat together if we're home and I had 20 minutes to think/create, prepare and cook something yummy for myself. 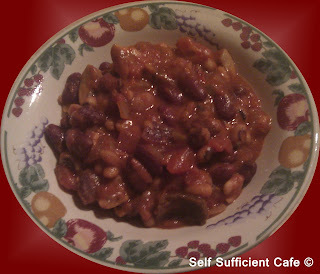 My tinned cupboard was raided and I concocted 3 bean chilli, which hubby says looks like a cowboys stew. Whatever it looks like it was very tasty, quick and good for you. Cut the onions into smallish pieces and fry in a little olive oil until translucent add the finely chopped garlic and fry for a couple more minutes. 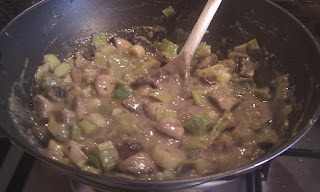 Quarter the mushrooms and add to the pan and fry for a further 5 minutes or until they start to release their juices. Add the spices and stir in the chopped tomatoes. Wash the beans under cold running water and drain, then add to the pan and stir to combine. Finely dice the 3 slices of jarred jalapeno's and add to the pan, bring to a boil and simmer for 5-10 minutes. 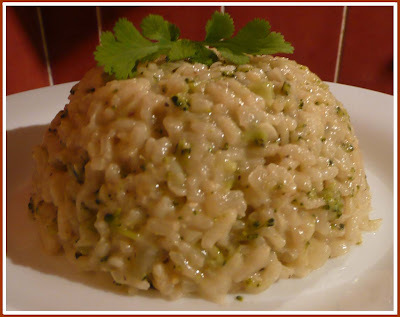 Serve with rice, mixed through pasta, over a jacket potato, or simply on its own. If you're feeling naughty it also goes very well with chips! Previously I had mentioned that I was going to undertake a review of ready made/processed vegan fare. It was somewhat of a surprise to find what I did on my latest visit to Sainsbury's. 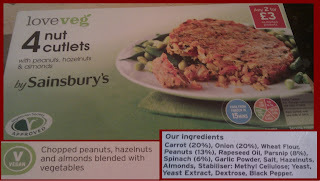 As I trawled through the frozen section at Sainsburys, not really expecting to find any vegan fare, I cam across two items that were in the vegetarian section. After reading the ingredients I figured they were suitable for vegans and purchased both items. It wasn't until I got home that I saw that they were both labelled suitable for vegans! Well done Sainsburys! The first item I chose to cook and eat were nut cutlets. These cooked in 15 minutes following the instructions, and were fairly crisp on the outside and soft inside. The overall taste wasn't unpleasant but it did have a floury taste. I had them on bread with salad so this was disguised a little. Would I buy them again? Maybe if there was nothing else to choose from or I ate them as part of a roast dinner with lashings of gravy. I'll keep you posted. But I still think thanks are needed to Sainsbury's who have tried to supply us vegans where other big chains have failed. I don't include company's who only make Vegan and/or vegetarian food, these are in a league of their own! I also received some vegan chorizo, which I didn't order. It had a sticker on to say that it had just passed its best before date, which I must admit doens't bother me especially when you see what I have in my cupboard! But after reading the packaging it was two weeks over the use by date so I'm afraid I threw it in the bin. I'm not a massive fan of fake meats, I don't see the point of them, I'm more of a tofu and vegetable girl. 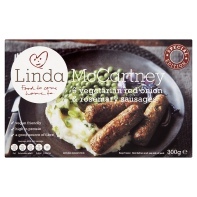 Although I won't say no to a vegan sausage, such as Linda McCartney's sausages, but that's as far as I go! I've never considered myself having a sweet thought but I think I need to reconsider this, especially looking at what I bought! Now I'm not sure when I'm ever going to use either the soy or rice cream and lets face it they'll probably sit in my cupboard for a few months before I get round to making something with them. Any ideas, please let me know! 3) Owning and running a healthy eating cafe/bistro "Self Sufficient Cafe"
4) Children and a dog! This list was revamped and detailed what I can do to make me happy right here right now! Once again in no particular order. 5) Enjoy my hobbies, camping, gardening, crafting, blogging and find an enjoyable exercise! My progress so far is good and not so good. I have lost weight a stone in total (although a few pounds crept back on over Christmas). My shoulder injury is making good progress and I am able to use it more than I have done in nearly two years! Hubby and I now own a gorgeous dog, which provides a lot of fun and laughter. I'm finally blogging on a regular basis, just hope I can keep this up! I'm planning future camping holidays with hubby and Marco, fun times ahead. My enjoyable exercise is walking Marco and at the same time meeting other dog owners and getting to know their dogs and them. Although I only know them by their dogs names! The not so good is I'm not really gardening or crafting at the moment, I think some of this relates to my shoulder injury and not having enough hours in the day! But there is an elephant in the room. It pains me to write this but after years of trying for a baby without success I have been told that it is highly unlikely that I will be a Mum. This, as you can imagine was extremely devastating to us both and although we were told a few months ago now, I'm only just coming to terms with it. Well, that's not quite true, I think I'm coming to terms with it and then someone else I know becomes pregnant and I realise that I haven't come to terms with it at all! Life just isn't fair sometimes! I know that its not anyone's fault, its just the luck of the draw but it doesn't quite feel like that. It's a huge burden to carry. I know I'm not alone but at times you really do feel like you are. Life goes on though and I will fill it with all the other things that I love doing, time is a great healer and time is what I need. I know that one is a biggie but overall on the up side I'm fulfilling most of what I set out to do which is good, in fact its fantastic! Well done me! 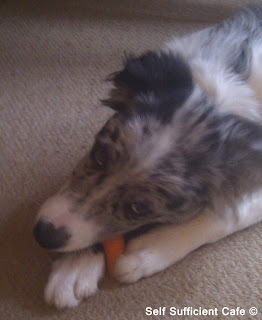 Here's an up to date picture of Marco, enjoying his afternoon snack - a carrot! He loves his carrots and goes mental when you ask him if he wants one! What veggies do your pets love (or hate)? My slow cooker had been on all week making dinners for hubby, he's been treated to all corners of the earth with his food! I wanted something with a bit of spice but not too much heat, some crunch and something different to what I had been eating. I was tired from a long day at work and I really needed something quick and easy. I looked through my store cupboard and fridge for inspiration. Lurking at the back of my cupboard was a chowmein stirfry sauce by Blue Dragon. The best before date had not been reached but it wasn't far off! I can't remember when I bought the sauce. There is a common theme running here, I always seem to buy food and then forget about it. The previous weekly menu planning only lasted two weeks, as I like to get creative in the kitchen as a stress reliever when I get in from work! Anyway, back to tonights tea, after spotting the chowmein sauce, I got a sudden urge to rustle up a vegetable chowmein. Let's face it, the ones you cook at home always taste better than a take away and I can't be 100% sure if the takeaway we use is 100% vegan not that I imagine they use dairy or eggs! Since turning vegan I haven't ordered a Chinese takeaway, in fact no takeaway has passed my lips, which can't be a bad thing can it? This was easy to rustle up as I also had some Cauldron Organic Marinated Tofu Pieces in the fridge. An essential standby to have for nights like this. After a quick check on-line that both the sauce and tofu were vegan I set to preparing tea. The vegetables I used were: spring onions, green beans, baby corn, broccoli and sweetcorn, which I just threw in the wok with some groundnut oil, over a high heat stirring all the time. I added a little soy sauce when the veg started sticking to the wok, I don't think I use enough oil but then again I don't want to either. 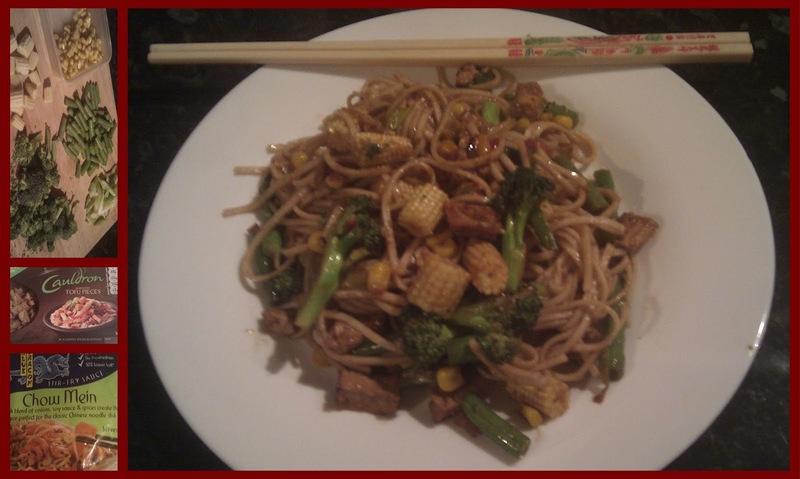 I stir fried for about 5 minutes, then added the marinated tofu and chowmein sauce. I'd also had a pan of boiling water ready for the rice noodles which only need 4 minutes cooking before you add them to your wok. Stir fry the vegetables, sauce and noodles for another couple of minutes to ensure everything is coated with the sauce and serve. Dinner is served in 15 minutes or less! I was tempted to go shopping but as we’re living on a very tight budget at the moment whilst we pay off our credit card (don’t ask!) I thought; lets be inventive and use what we have remaining in the cupboards! Now, I have a system for food - kept in the kitchen cupboards are what we buy at our fortnightly shop. In the garage are a couple of cupboards, which act as my storeroom, these are filled with food with a long shelf life that have been on offer and/or we use regularly. For instance tinned tomatoes, Nori Tofu, pasta etc . . . . .
After looking in the cupboard to see what I had to work with it was fairly easy to come up with an idea. 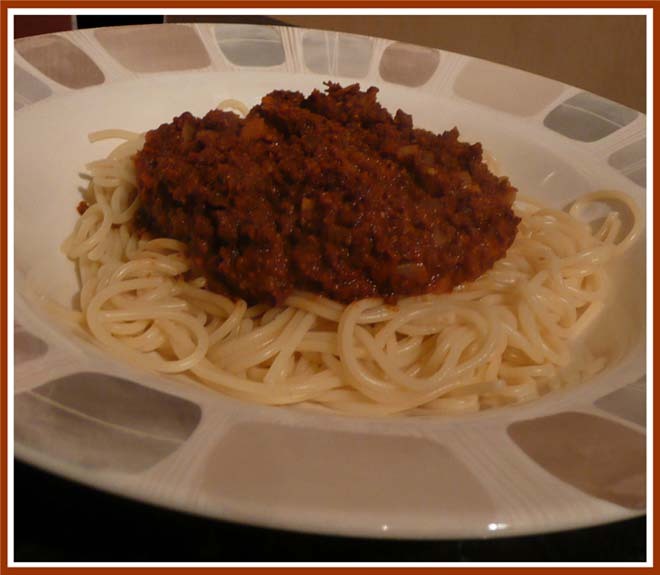 Spaghetti no bolognaise. Follow the packet instructions to make the soya mince, but also add ½ tsp of dried cumin, coriander, paprika and garlic/onion powder. Too make the sauce, fry the onions in the oil until translucent and add the crushed garlic, fry for 2 more minutes. Add the tomatoes/passata and stir. Add the paprika, mixed herbs, sugar, salt, red wine vinegar, red wine and chilli flakes and bring to a boil. Turn the heat down and simmer until the sauce has reduced and is a little thicker. Add the tomato puree and keep on a simmer until needed. Sauce should become really glossy and thick. Meanwhile fry the onion in a little olive oil and when the onion is soft, around 5 minutes add the soya mince and stir to combine. Add the sauce and stir, keep on a low simmer for 5-10 minutes, to cook through. Serve with spaghetti or pasta of your choice. As you can probably tell, even from the few posts I've done so far, we eat food from all corners of the earth, veganised of course with a twist! Tonight it was Italy, and on the menu was broccoli & cauliflower risotto. Fry the onions and garlic for about 5 minutes, until onions are translucent. Add rice and cook, stirring constantly, for 2 minutes adding salt and pepper to taste. Add 50ml of vegetable stock and bring to the boil, stir until stock has been absorbed by the rice. Pour in the wine and stir, cook for about 3 minutes to evaporate the alcohol. Add the vegetable stock a little at a time, stirring occasionally, letting the rice absorb before adding any further stock. 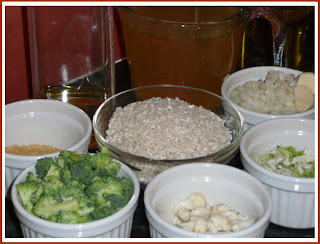 Repeat a further two times then add the chopped broccoli and cauliflower. Continue adding the stock a little at a time and after about 20 minutes you should have used most of the vegetable stock. Add the nutritional yeast flakes and stir thoroughly to combine, add a little more stock if the mixture feels to thick (or warm water if you have used all your stock). Take the pan off the heat and stir in the vitalite very fast, this creates a creamy texture. If you're not vegan you can add grated cheese instead of the nutritional yeast flakes, but either is extremely tasty. 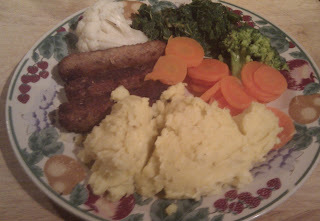 Last Saturday I cooked with the Linda McCartney Sausages for the first time and reported that they weren't too bad. Click here to see the quick and easy dinner. This has got me thinking and every now and again I will review a different product and report my findings. The idea is that I will investigate whether or not the processed/ready made food is a help or a hindrance in the kitchen especially when you need something quick and easy. 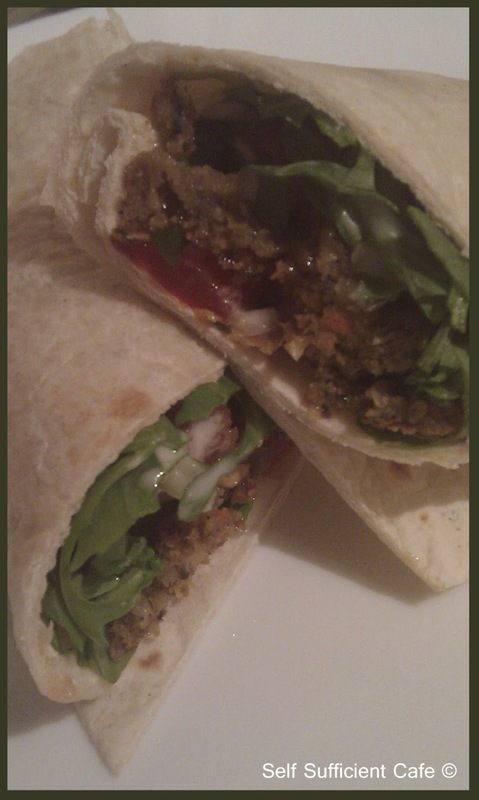 Today I chose already made falafel and turned them into a spicy wrap with rocket, homemade tomato salsa, sweet chilli sauce and vegan mayonaise. The verdict - surprisingly tasty! Place your wrap on a board and add the rocket a third of the way up. 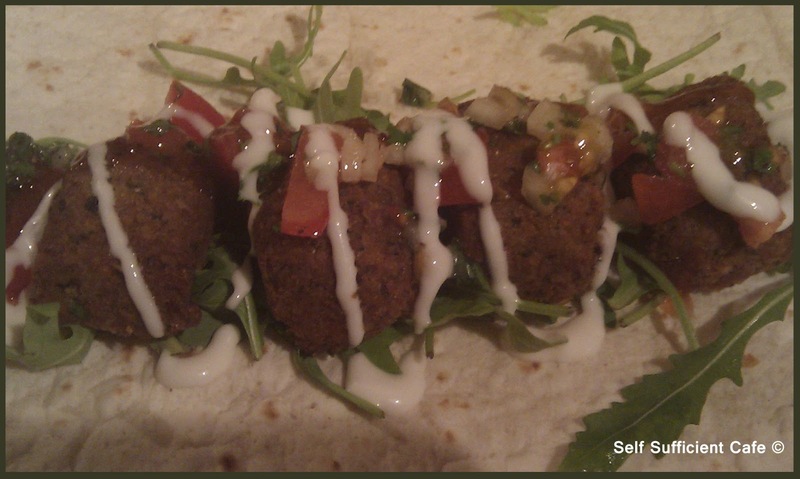 Cut the falafel's in half and place on top of the rocket. Spoon over the homemade salsa and trickle over the sweet chilli sauce and vegan mayonnaise. For the homemade salsa you will need 2 tomatoes, 1 small onion and a small handful of fresh coriander. 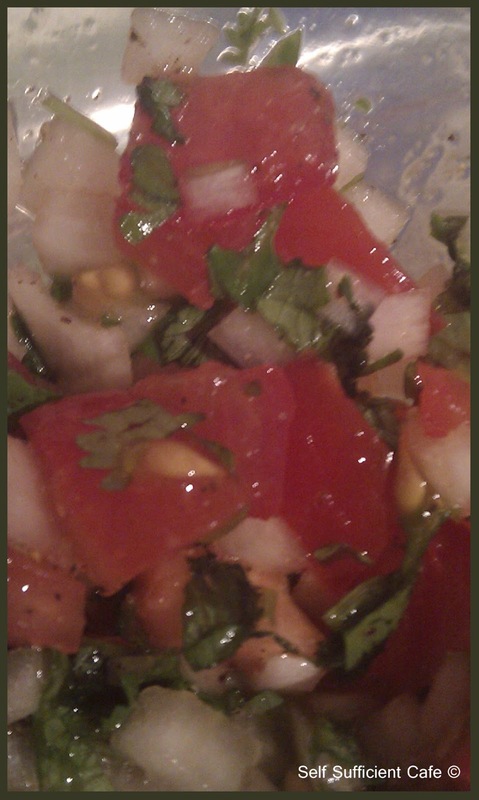 Finely chop the onion, tomatoes and coriander and put in a bowl. Add a little salt and freshly ground black pepper and mix to combine. If you wanted to use this as part of a Mexican spread just add a finely diced chilli to the mix. Now, if you remember I tried the Linda McCartney sausages on Saturday, in the packet were 6 and as I only ate 3 there were another three lurking in my fridge that needed using up. So I used them in a spicy sausage pasta dish. This could easily serve 4 people if you used around 300g of your favourite pasta shapes. Finely dice the onion, celery and garlic and saute in a little olive oil for around 5 minutes or until the onions are translucent. Add the chilli flakes, paprika, mixed herbs and oregano and give the mixture a good stir. Slice the sausages and add to the pan with the jalapeno's and stir to combine. Add the passata and a little water to thin out the mixture just a little. Bring to the boil and simmer for 5 minutes. Add the cream and heat through being careful not to allow the mixture to boil. Boil 300g of pasta till al dente and add to the sausage mixture. Stir thoroughly so all pasta shapes are coated in the sauce and serve at once. You will (hopefully) have seen my previous post on work snacks which showcased houmous and carrot sticks and guacamole and crisp breads. That satisfies the times when I fancy something savoury, however the times when I fancy something sweet it just doesn't fill the gap. Another snack I take to work is a fruit salad, which I make up at the weekend with fruit that is either in season or on offer. Check out the knock down price area of your local supermarket, it amazes me what you can pick up. OK the food sometimes looks a bit sorry for itself but add it as an ingredient with something else and magic happens! 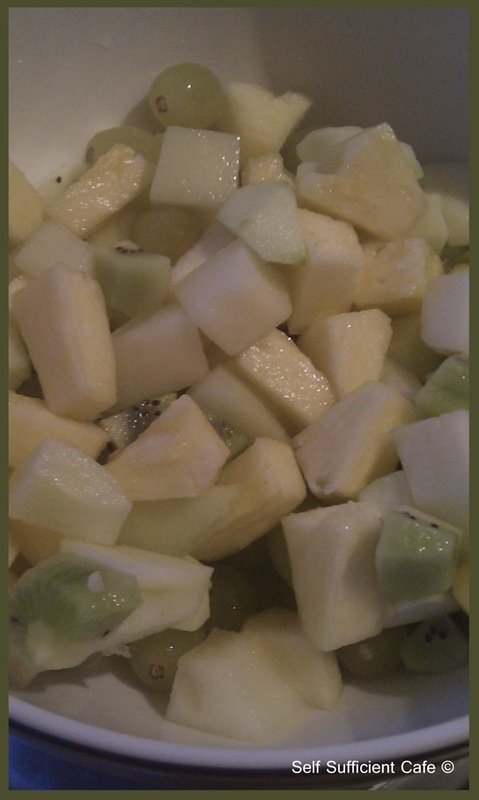 This weekend I put together a batch of fruit salad, which consisted of ½ honeydew melon, ½ a pineapple, 2 apples, 2 kiwi fruit and a handful of grapes. 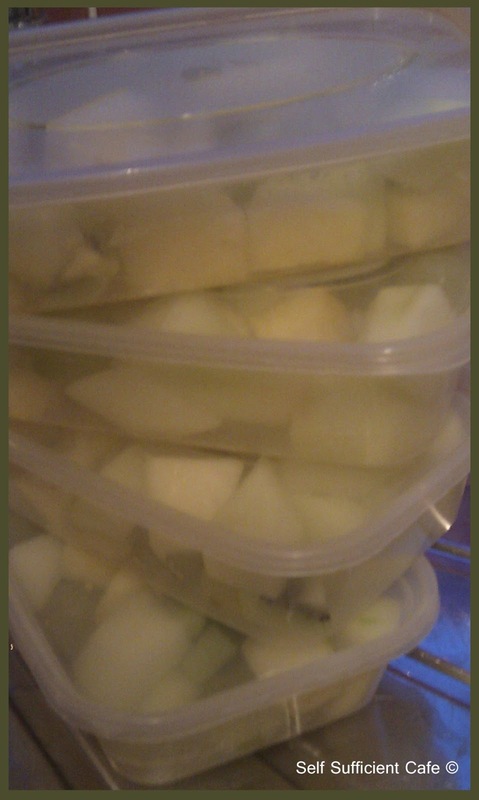 I squeeze over some lemon juice to stop the apples from going brown and store it in the fridge for me to dip in and out of over the week. This particular batch made 4 servings, which I packed up in 4 recycled take away boxes. Another thing I do is buy some soy yoghurt, my favourite being Alpro Vanilla and just measure out small portions in little tupperware boxes. You can buy one portion soy yoghurts too, most supermarkets even have their own brand. It's Saturday, woohoo! After a busy day sorting through paperwork that I've hoarded over the last few years, yes years! I was tired and in need of a quick and easy diner tonight. Whilst shopping last night I came across a product that I've not seen before. This doesn't mean that it has only just come out though! I don't normally buy process foods I'd rather know what I'm putting in my body, well these days at least! But something caught my eye, Linda McCartney Red Onion and Rosemary Sausages. They're Vegan friendly and reported to be high in protein and a good source of fibre. As process foods go, these weren't that bad. 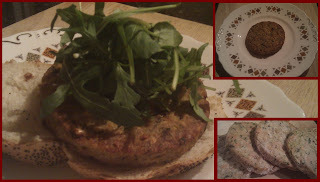 I'm not really into fake meats at all, but the vegetarian/vegan sausage is something that I will tolerate, even enjoy! 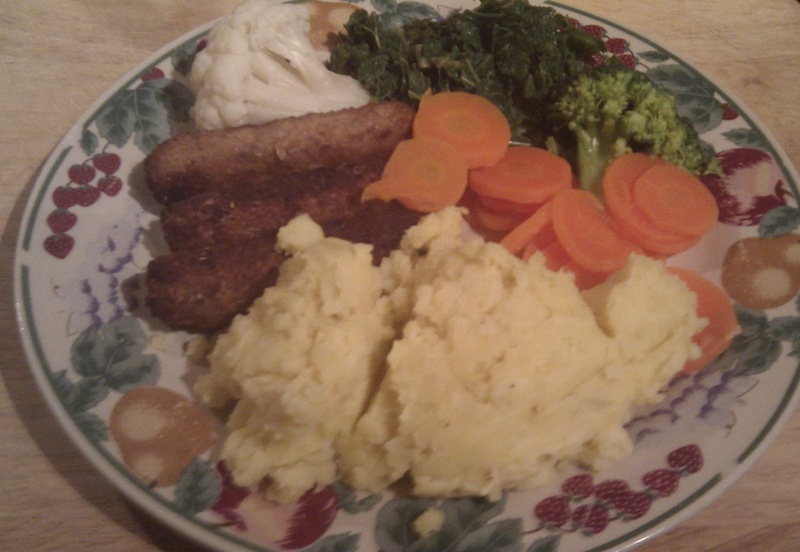 I made up some mash potatoes using vitalite and soy cream and served with carrots, cauliflower, kale and broccoli. It snowed an awful lot here yesterday, and we woke up this morning to find that it was still here. I needed something comforting and soup was the obvious choice. After checking what food I had in, it was an easy decision, leek and potato soup. 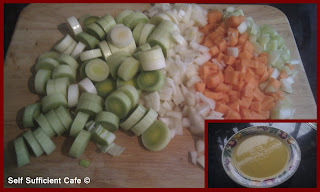 I also added some carrot and celery to give it depth of flavour. I think homemade soup can do wonders for us all. Why not have a go at making this very easy recipe? Dice the carrot, celery and onions and thickly slice the leeks and saute in a little olive oil until the vegetables start to become soft. Add the oregano and give the mixture a stir. Dice the potatoes and add to the pan followed by the vegetable stock. Give everything a good stir and bring to the boil, simmer for 10 minutes until the potatoes are soft. Leave to cool slightly add salt and pepper to taste and blend till silky smooth. When you get that Friday fajita feeling there is only one thing to satisfy your cravings, vegetable fajita's. As its Friday and we had got in late after shopping, we were hungry and I decided I needed to cut corners! Fry the onions for a couple of minutes then add the baby corn and butternut squash and cook for a couple more minutes. Add the red pepper strips and broccoli and stir, cook for 2-3 minutes. Add the courgette and stir to combine, cook for another 2-3 minutes. Really all you are doing is stir-frying the vegetables.Sprinkle over the packet of fajita mix and stir to coat evenly. 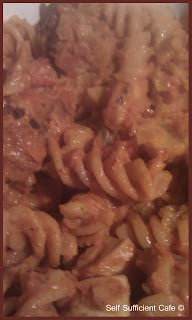 Add in the tin of chopped tomatoes (or carton of passata) and stir. Add in the refried beans, this thickens the mixture. Leave to simmer for 5-10 minutes, stirring regularly so as not to let the mixture stick to the bottom of the pan. Fry the onion and garlic in a little olive oil (or vegetable stock if you’re a no fat kinda person). Add the chopped courgettes and red lentils and stir well. Add the soy sauce, vegetable stock, thyme and bring to the boil. Once boiling turn down the heat and simmer until the liquid has reduced and the lentils cooked, it can look quite mushy, but don’t panic it tastes divine. Whilst the lentils and courgettes are simmering make the white sauce, put the Vitalite, flour and soy milk into a saucepan and heat gently stirring all the time until thickened. If it’s not as thick as you like then mix together a bit of cornflour and water and add to the white sauce whilst stirring. 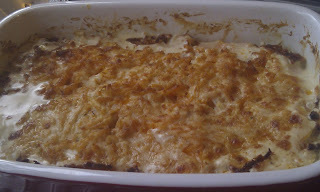 Once the sauce has thickened add grated nutmeg, pepper, salt, nutritional yeast flakes and ‘cheese’. Pour the lentil & courgette mixture in a baking dish, top with the sliced celeriac, overlapping and then top with the white ‘cheese’ sauce. 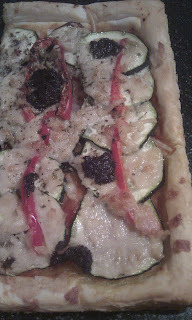 Let settle for a couple of minutes and then scatter the breadcrumbs on top. 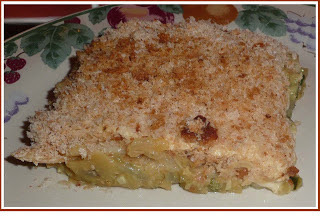 Put in oven and bake for 35-30 minutes or until breadcrumbs are golden brown. 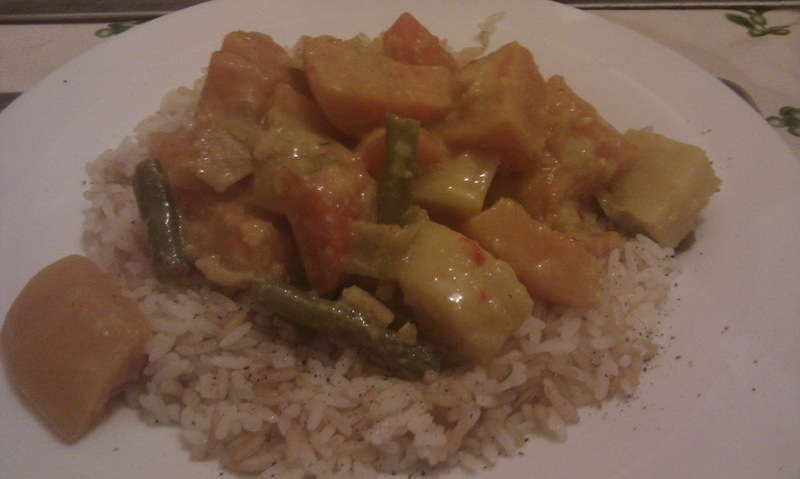 Today I was craving a vegetable curry. I needed some spice after all that comforting food of pies and bakes. I was also in the mood for cooking up a storm. Now don't get me wrong, I always enjoy cooking but some days I really like cooking! Like everyone else I also enjoy the odd shortcut like a prepared curry paste but today was not one of those days and I made my own curry paste from scratch. All I did was throw in a load of ingredients into my small food processor (yes I have a small one and a big one!) and turn it on - simple! Roughly chop the onion, ginger, garlic and chillies and add to your food processor, pulse at first to chop more then process till as smooth as you like. Add this mixture to a little oil in a heavy based pan (I always use my wok, I would never be without it) and saute for a couple of minutes before adding a tsp each of the normal curry spices. Continually stir whilst sauteing for a further 2-3 minutes. Chop all your vegetables you choose to use to similar sizes and add to the pan giving it a good stir so that the curry paste coats all your vegetables. Pour in the coconut milk and bring to a simmer, cooking until your vegetables are tender, around 15-20 minutes depending on the size you cut your vegetables. Be careful not to over cook the vegetables you don't want it turning into a sloppy mush you want a little bite in your veg! Serve with cooked rice (I like wholemeal rice) and enjoy! In a previous post I wrote about my experience with graze, a company who send out small snack sizes of food to your work or home address. I tried it out for three weeks and ordered a total of 6 boxes. Overall the snacks were OK, some I wouldn't order again and some I loved! I told you that I would be trying out my own ideas of small snacks as this way I can control the portion sizes and the ingredients used. 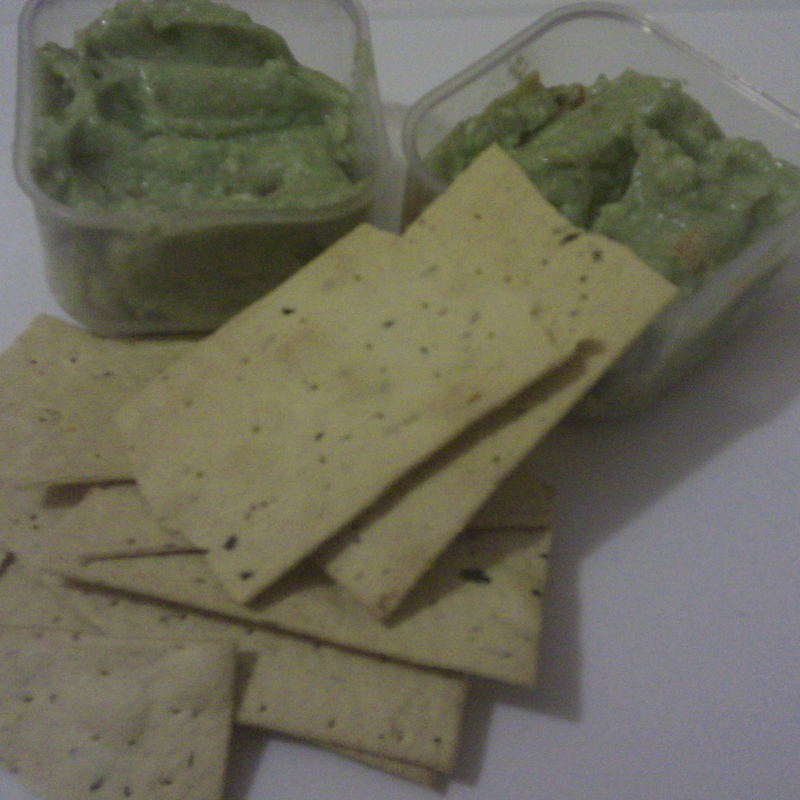 My two favourites to date are houmous and carrot sticks and guacamole and crisp breads. 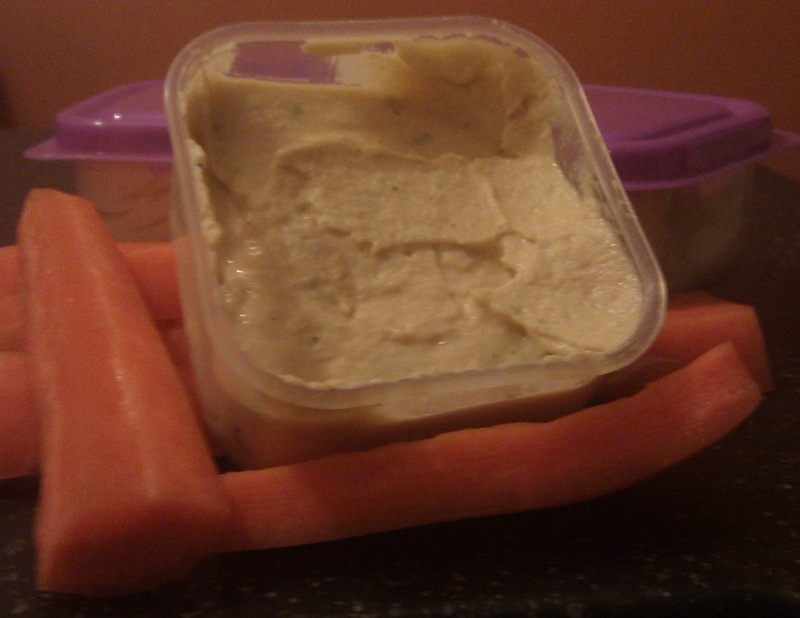 To make your own houmous, blend together a small can of chick peas (drained, juice reserved), a tablespoon of tahini, juice of half a lemon, ½ teaspoon of cumin and a little of the drained liquid. Blend to your desired consistency adding more of the reserved liquid. This made me three portions. Serve with carrot sticks and crunch to your hearts content. For this batch I also added a small handful of shredded basil leaves. You can really add anything you like once you have the basic recipe. Try adding roasted peppers or carrots for a difference. To make your own guacamole, mash an avocado with the juice of ½ a lemon, this will stop the avocado going brown. Finely chop 1 tomato and a small onion and add to the mashed avocado. Add salt and freshly ground black pepper and mix thoroughly. Serve with crispbreads. 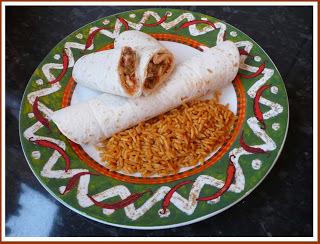 This can also be served with tortilla chips, or as an accompaniment to any Mexican meal. Have you got any ideas for healthy portable homemade snacks? Score a rectangle about 2cm in from the edge of the pastry to allow the sides to plump up and give you a border. Spread some tomato passata over the puff pastry and add the vegetables in layers finishing with the cheese and pesto on the top. Bake in a moderate oven (180°C) for around 15 minutes or until the pastry is golden. Serve with a garden salad of rocket, lettuce, tomatoes, cucumber, spring onion and cucumber. 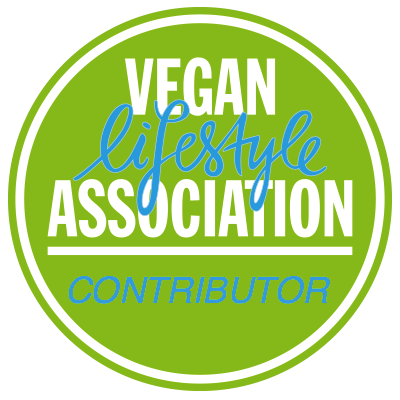 I have continued my quest to find other vegan bloggers that are based in England and to my excitement I found something better! As well as finding 10 other vegan blogs I came across "To Happy Vegans" who invite you to join a scheme where you swap vegan food goodies with another vegan. What a brilliant idea! 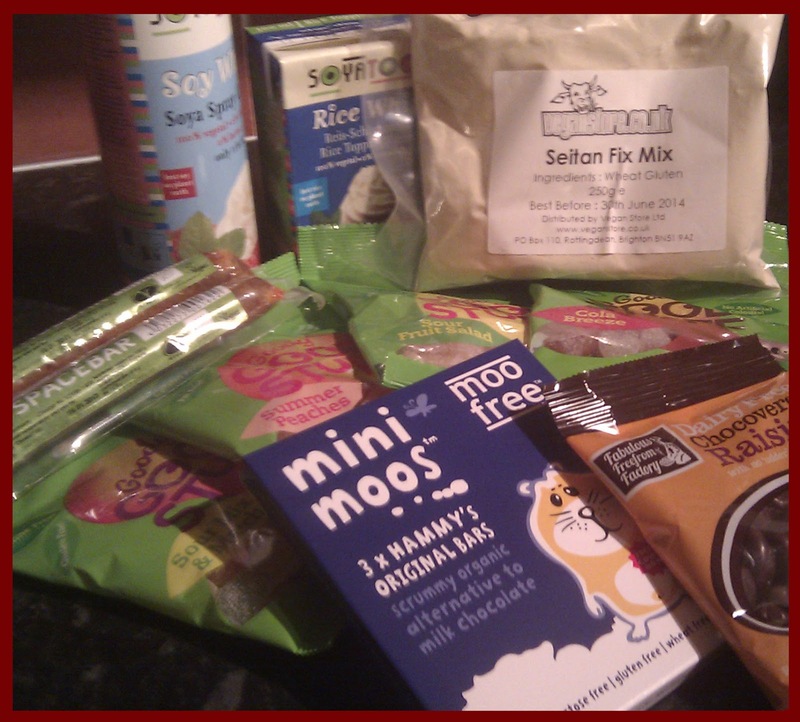 "Every month you are assigned a partner to send a parcel of vegan goodies to and in return you receive your own parcel of surprise delights!" I signed on the dotted line straight away! Unfortunately I think I was too late for the January swap but hopefully I will be included in the February swap of vegan goodies. Now what can I package up for my first parcel of vegan fare, I will start jotting down my ideas. I really despise throwing out food, especially when there is so much hunger in the world and I try to utilise everything that I buy. Most vegetables that are left in the crisper tray that look a bit sorry for themselves are turned into soup. You would never know the sorry state they were in beforehand. Today though I was a little 'souped' out and wanted to try something different. 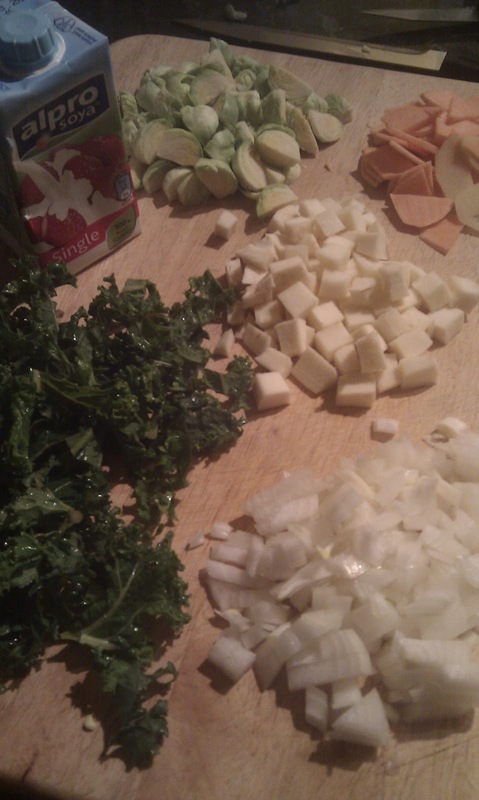 The food that needed using up consisted of, sprouts, sweet potato, kale, parsnip and a tiny bit of soy cream. As you can see from the photo there was not a lot left of each of these vegetables, so they wouldn't provide a meal in their own right. 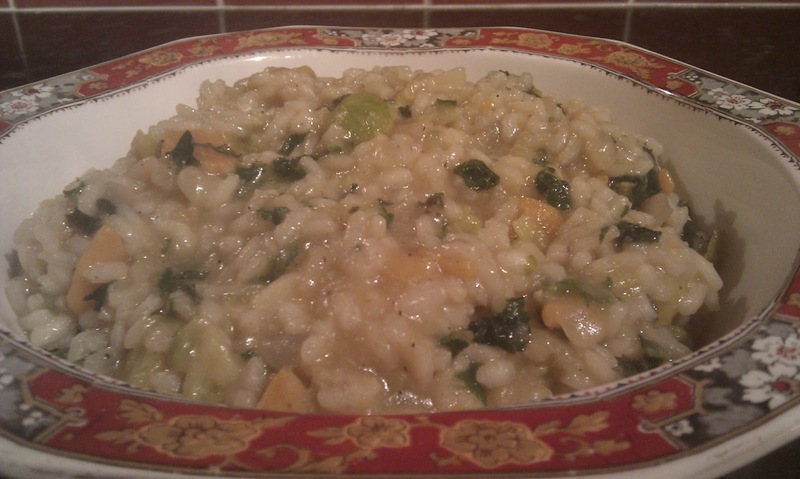 Thankfully I also had some onions and arborio rice lurking in my kitchen and therefore roast diner risotto was born. All I did for this extremely tasty (even though I do say so myself) meal was saute the onions until translucent then add all the other veg and stir. Next add the rice and coat with the oil and veg. Slowly add a little vegetable stock at a time until all the rice is cooked. Once cooked and to your desired consistency add a small knob of vegan spread (I use vitalite) and quickly stir through the rice mixture, this gives a shine to the dish! I found this out by accident but I'm glad I did. Serve at once. The above picture of vegetables actually made two portions of risotto, to reheat the remainder I added a little water so it wasn't so stodgy. (The rice will soak up any liquid remaining). It was delicious, you really must try it. I will certainly be making it again! Do you like my new serving dish? I picked it up from a charity shop in town for a bargain price of £1.50! With Christmas celebrations long gone, we were now back into the birthday celebrations and I have a few to contend with in January. My Mother-in-law reached a landmark today at 65 and I held a dinner party in her honour. It is extremely difficult where I live to find restaurants which cater for us vegans as you will have seen from one of my previous posts. I figured it would be more enjoyable to cook for the 6 of us and I know everyone would appreciate the effort especially when everyone was skint after Christmas! 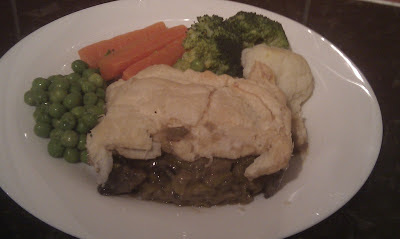 Once again the Parsnip and Butternut Squash Ovenbake made an appearance along side a Leek and Mushroom Pie. As I was only feeding 6 people I didn't use all the butternut squash and parsnips, so these were turned into a hearty soup. Cube the butternut squash and parsnips and spread over a baking tray and drizzle with olive oil. Roast for 30 minutes or until the vegetables are soft and starting to brown. Whilst the vegetables are roasting, finely chop the celery, onion and garlic and fry in a little oilve oil until the onions are transparent. Add the bouillion powder to the 600ml of hot water and stir to dissolve. Add the roasted vegetables to the onion mixture, followed by the vegetable stock and bring to a boil and simmer for ten minutes to ensure all vegetables are soft. Add salt and pepper to taste and leave to cool slightly before processing in a blender to a smooth and silky texture. Place the finely chopped onion, thyme and soy cream in a saucepan and slowly heat up. Do not let the mixture boil. Whilst the soy cream is warming finely slice the butternut squash and parsnips and layer one vegetable at a time in an ovenproof dish. Pour the heated soy cream mixture over the vegetables and sprinkle with the grated cheese. Bake for 1 hour, if the top starts to burn wrap silver foil over the top. Quarter the mushrooms and thickly slice the leeks and saute in a little olive oil. The mushrooms will release their liquid so the pan should never be dry. Add the flour and cook out for a couple of minutes before adding the English mustard and stir through. Add the thyme and soy cream and stir through again. Pour in the vegetable stock and bring to the boil, simmer until the mixture has thickened to a pie like consistency. You may need to add more water if it gets too thick. Pour into an oven proof dish and lay the puff pastry over the top tucking in the sides. Bake for 30-45 minutes at a temperature of 180ºC.